Ad dollars follow eyeballs, and these days they are on social. The increase in social-ad spending is driven by this continuously growing reach, particularly on mobile, better analytics and targeting, and performance. The rise of programmatic social platforms has also fuelled growth. New data from BI Intelligence finds that US social-media ad spend will top $US8.5 billion this year and reach nearly $US14 billion in 2018, up from just $US6.1 billion in 2013. In the report and associated PowerPoint presentation, BI Intelligence looks at all the numbers and explores the drivers of social ad adoption. 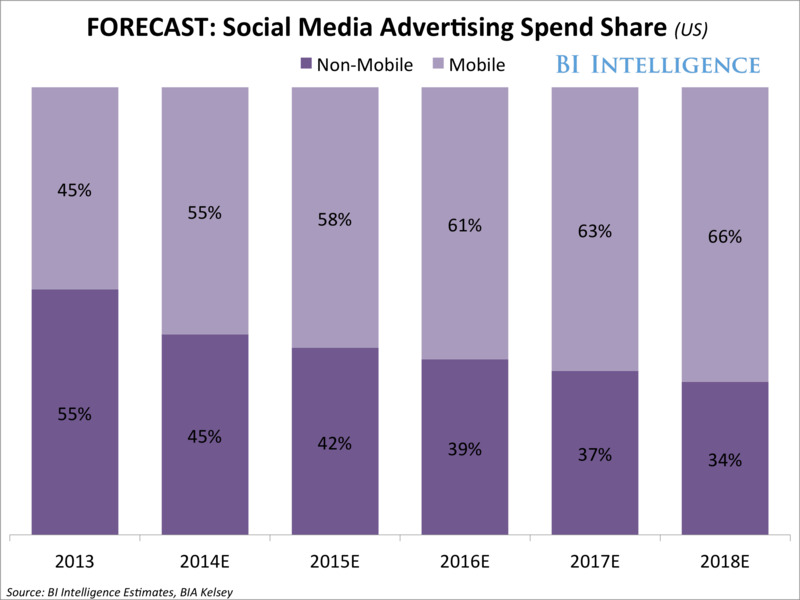 Social-media advertising spend will grow rapidly through 2018. It’s up 40% this year and will top $US8.5 billion, growing to nearly $US14 billion in 2018, a five-year compound annual growth rate (CAGR) of 18%. Social media ad spend has reached the mobile-tipping point. Spending on mobile social-media ads, including mobile app-install ads, will surpass non-mobile spend by the end of this year in the US. 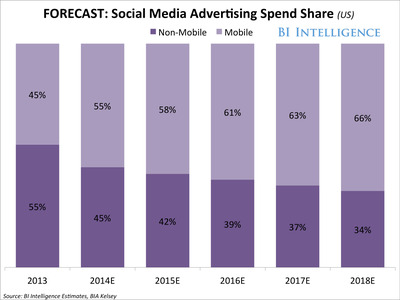 In 2018, two-thirds of social-media ad spend will go to mobile, creating a $US9.1 billion social-mobile market. Mobile app-install ads and programmatic buying are also growth drivers. Analyses suggest that mobile app-install ads could account for anywhere from one-quarter to more than one-half of Facebook’s mobile ad revenues. Social programmatic ad platforms are also growth engines. Spending on FBX, Facebook’s programmatic platform, increased by 150% year-over-year globally during the second quarter of 2014, based on a sample of advertisers compiled by Ignition One. Prices are increasing as performance and targeting improve, even as ad loads stay steady on the established platforms. Facebook, for example, is not likely to increase the amount of in-feed native ads an average user will see. The market is expanding with the introduction of paid ad units at Pinterest and Instagram. The report is full of files, slides, charts and data that can easily be downloaded and put to use. For full access receive to all BI Intelligence’s analysis, reporting, and downloadable charts and presentations on the digital media industry, sign up for a free trial.